The marshmallow represents Christ's body, rolled in butter and cinnamon to represent oils and spices used to anoint the body upon burial, wrapped in crescent roll dough to signify the tomb. Close tightly, sealing the seams. Break open the tomb and the body of Christ is no longer there! what a great idea...we did something similar...but not unusual to our everyday habits....i said "Time for Breakfast" they took too long getting there....by the time they showed up, their bfast was gone. i said "see, just like jesus and the empty tomb." burp. 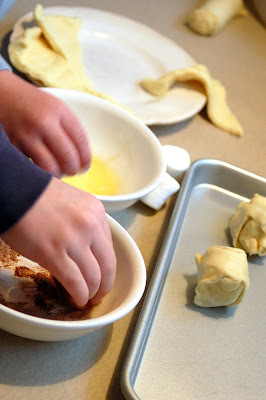 I read about the Easter cookies you made on your blog... way more involved than our easy rolls! Love this idea! What is crescent roll dough? I have to say...I've done this in the past with my kids, and so yesterday I had volunteered to lead the 1st and 2nd graders during Jr. Church (second half of service). I decided to do this because my kids always liked it, and I asked my teenager to help me. He was a great assistant, but he started snickering when I said, "And this marshmallow represents Jesus" and it was just soooooo hard to proceed from there!! 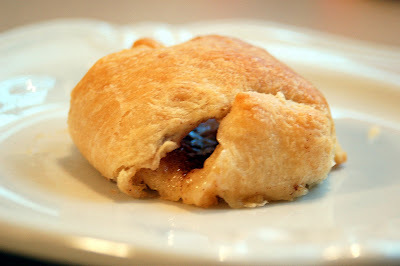 embejo~ You can purchase crescent roll dough in the tubes at the grocery store. It is in the refrigerated section with tubes of cinnamon rolls and cookie dough, etc.